Sunday School is from 9:00 - 9:50 AM and there are Sunday School classes offered for all ages including a staffed children's nursery. We've tried to address a number of questions here on this "What to Expect" page, but please, if you have a question that's not answered here, just ask ... by contacting us. Gehman Mennonite Church is a family of believers near Adamstown, Pennsylvania, seeking to walk with Jesus … personally, locally, and globally. ... other events can be found to the right or on our calendar. How long are the services? - Sunday School is 9:00-9:45 am. The Sunday morning Worship Service is 10:00-11:00/11:15 am. Is worship contemporary or traditional? - Some might describe the worship here as "blended". The songs are both from hymnals and also on a screen lead by a worship team with a variety of instruments. Our parking lot is all unmarked general parking as shown in the photo to the right. The upper entrance (closest to the street) is the closest entrance to the main auditorium, while the other two entrances lead into the lower level of classrooms and the fellowship hall. 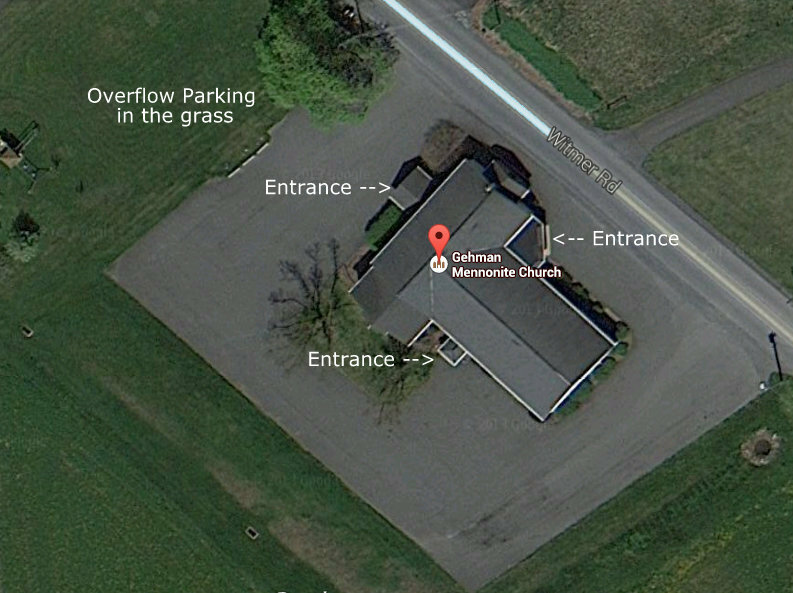 If our paved parking is full, the grass lawn to the right (when facing the church from the street) of the church is owned by the church and available for overflow parking. Wheelchair accessibility - Our church is handicap accessible to the ground floor and the upper floor (auditorium level). The church also has a ramp that leads to the fellowship hall on the ground floor. We also have a handicap accessible restroom on the ground floor. Hearing Assistance - Our church is equipped with a hearing assistance system for the hearing impaired. To obtain a receiver simply ask an usher or greeter or visit the sound area at the back of the auditorium. Fellowship Meals - Build relationship by coming the first Sunday of each month to the shared lunch after our Sunday morning worship service. If possible, bring a hot dish and a dessert to share. Walking with Jesus Locally - Use your gifts to bless others in the church and community. Walking with Jesus Globally - Promote and being involved in what God is doing in our country and around the world. Photos and Videos - Learn to know others through photos of our past services and activities. Thanks for stopping by, we hope to see you soon!